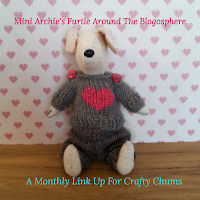 Archie the wonder dog: Quarter one is over, already! Quarter one is over, already! In January I linked up with the Finish-A-Long (find my Q1 list here) and put three things on my list. 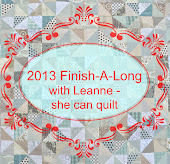 It's now time to link up again and declare my finishes, so here goes! 2. (I'm saving the first item on the list for later in the post 'cos it's the one you haven't seen!) Finish my stumpwork anemone - prepare the detached petals and attach to the flower and then mount on a canvas block. Finished!! Now living at my parents' house, in a cupboard, I think!! 3. Finish and block the mystery knitting. ('Mystery' because I couldn't post a photo without spoiling a surprise. Fortunately, Our Dear Leader is very accommodating and let me email her a secret photo, to prove the project had indeed been started.) Here's Deb's scarf, all finished! 1. Finish joining my Marmalade hexies (generously donated by Leanne aka Our Dear Leader) and make into a cushion, inspired by this gorgeous cushion. Finished! It doesn't have a name but if it did it would be called 'Can I have a P please, Bob?' For those of you thinking 'Eh? ', click here and scroll to about 55 seconds in. Enjoy! A lovely cushion with a quilt top in progress dumped in front of it. My hexy quilt lives in front of it so the only time I see the whole cushion is either when I'm adding more hexies to the quilt or when someone comes to visit and I put the quilt somewhere far away from cups of tea and coffee! It's easier/better, in my opinion, for this quilt top to not be folded unnecessarily (although I suspect my mam would say that it's unnecessary to leave it in a heap and looking untidy!) because it 'upsets' the seam allowances. What I mean (and am finding it difficult to explain!) is that if I fold it then some of the seam allowances end up crumpled (and sometimes fold back on themselves) and need re-pressing whereas if the top lives in a heap then they seem to keep their direction. (Am I making sense? No, I thought not!) It's not a problem I've had with any of my other tops (whether hand or machine pieced) so I suspect it's something to do with the multi-directional seams. Or the way I fold. Probably the latter! 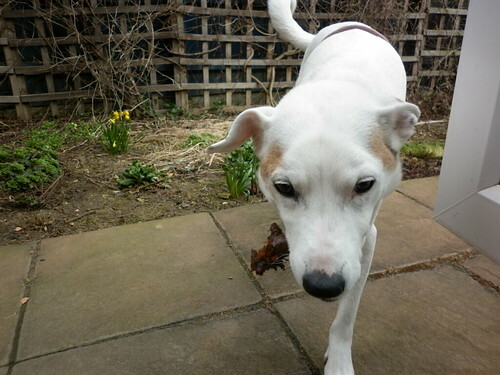 I'm bringing my stick inside and you can't stop me. I'm sure it's time for tea - stop faffing on the computer and feed me! Helen's scarf is beautiful (I am in awe of your knitting skills) and the Blockbuster cushion is lovely! Archie just improves with age doesn't he? More debonair and handsome every time! Archies's ear matches his cushion! And I like your green cushion too! I'm in love with the blue scarf and the beautiful cushion. And with Archie,of course. Oohhh I love your cushion! Oh I love your marmalade cushion: the honeydew fabric is just perfect for the marmalade! Beautiful springtime cushion! I'm adding honeydew to my wish list. I don't understand how Archie stays so beautifully white - my two are covered in mud and they have only been out in the garden to pee! Beautiful cushion! LOVE that cushion and having a right old giggle at the Blockbusters - I used to love that programme! Now. 'Fess up. You totally bought Archie's spotty cushion coz it matches him, didn't you? Such prettiness..... I love that scarf colour and your knitting is so even. And I shall try smearing some honey dew with marmalade. Yum. I am SO lucky to be the owner of that lovely scarf. I can attest that it is beautiful and snuggly! I gasped when I saw your cushion. Stunning!! Congrats on meeting all three goals. The knitting and cushion both look great. 3/3 - what a teacher's pet!! 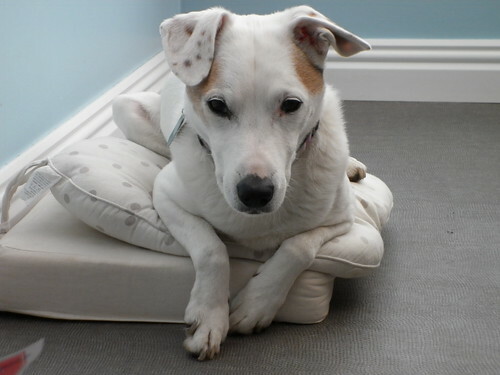 I really love your beautiful work but I have to say that I really get happy seeing your wonderful Archie :) soooo cute! I particularly love the green cushion, fab! Your flower is gorgeous. Hexagon cushion is beautiful amazing colours. Of course Archie steals the show. Hexie cushion so fresh and springtime! Lovely. You star turn! You did so well on the FAL, I love each of these projects. And I am almost done checking out the lists too.